We follow an important philosophy in our design work, and that is to compliment, not compete. Our custom-made stair railings give a homeowner a new look to their already beautiful home, and a fixture that looks like it belongs. 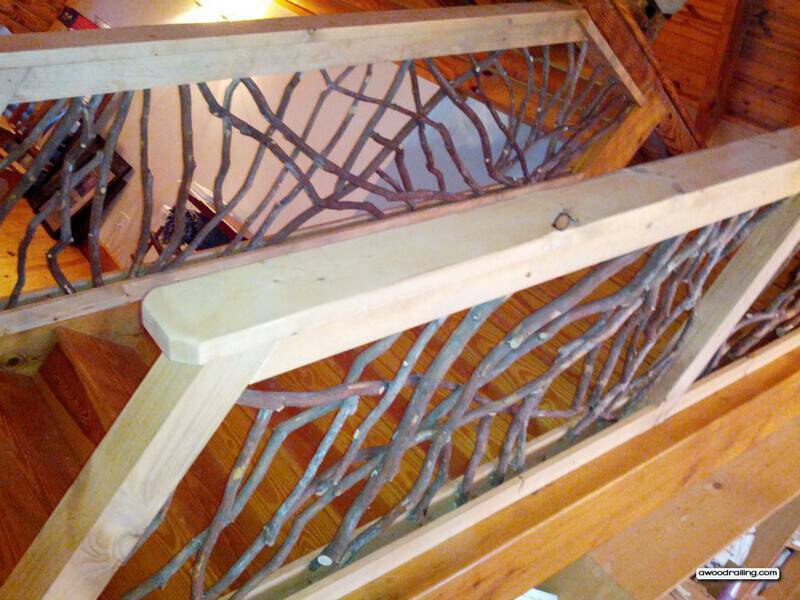 Our rustic staircase railing designs are gorgeous, yet cozy. There is a lot to our work that you may not notice at first glance, but we know the devil is in the details, and those details are what make the difference in a staircase railing project that comes out beautifully. Designing stair railing is actually many jobs in one. It takes an eye for design, as we always want to add beauty to the home, not just an awkwardly installed fixture. It takes an understanding of safe construction, as staircase railings are intended to add support and aid someone walking up and down the stairs. And lastly, we always have to put ourselves in the shoes of someone who lives in the home, and interacts with that environment every day. We strive to make home feel even more like home. Making our clients feel comfortable in their homes is a job we take very seriously. Our work goes all around the country. Most recently the crew took a drive to install a rustic stair railing near Mocksville, North Carolina, a beautiful part of the country that boasts the tagline, “time well spent”—our goal was to create a home where this rang true. The home was located in a small town with a great deal of natural beauty in the area, and this home fit perfectly within the geography and landscape. However, this beautiful log home was in desperate need of a handrail for safety and ease of access to the second-floor loft. Safety, of course, is what we consider first in our design, so we made sure whatever structure we placed alongside the stairs was strong and sound. We only use materials that we know can withstand a great amount of weight over time, and work closely with contractors to ensure impeccable installation. We also wanted to make sure the railing design was balanced enough not to be overwhelming. Our designs can be very grand and regal, and can add a lot of beauty in a home, but size, placement, and coloring have to be carefully considered so that staircase railing does not take away from the rest of the home. Before diving into the project, we took some time to get to familiarized with layout and design of the house, and come up with a something that looked like it belonged, not just haphazardly added. Every piece is custom made for our clients’ homes, not pre-made in a factory. Our clients know that, and that is exactly what has us driving us all the way to North Carolina for staircase railing installation! We took a tour of the home, designed the railing, and then got right to work with the installation process. We took our time to ensure safety and sound structure, and also pored over the entire thing to make sure nothing was amiss. The staircase we installed ascends from the left to right of the great room, creating a visual division. The timber frame trusses are finished with pine tongue and groove ceiling boards that give the home a radiant wood glow. 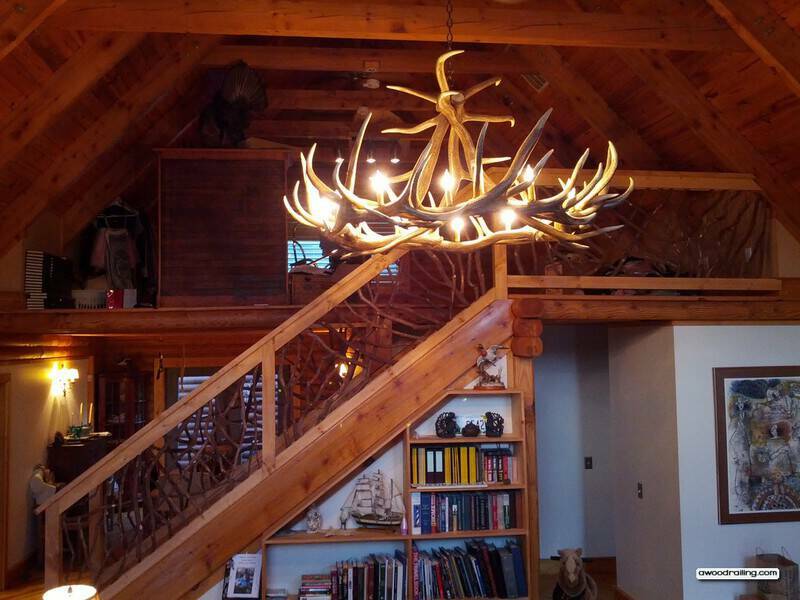 An ornate antler chandelier hangs from the ceiling and only adds to the woodsy motif. The homeowners have cleverly utilized the space under the stairs to display part of their library, and the stain on the stairs matches exactly with the shelves on the library.. The railing extends beyond the stairs and also serves as a protective barrier on the balcony part of the upper loft, allowing continuity of the overall design. The railing design has a webbed quality to it, so it is fairly see-through—this keeps from breaking up the room too much, and allows it to still feel large and comfortable. Kristin is spot on—imagination plays a pretty major role in what we do, and we like to think of ourselves as experts in imagination. 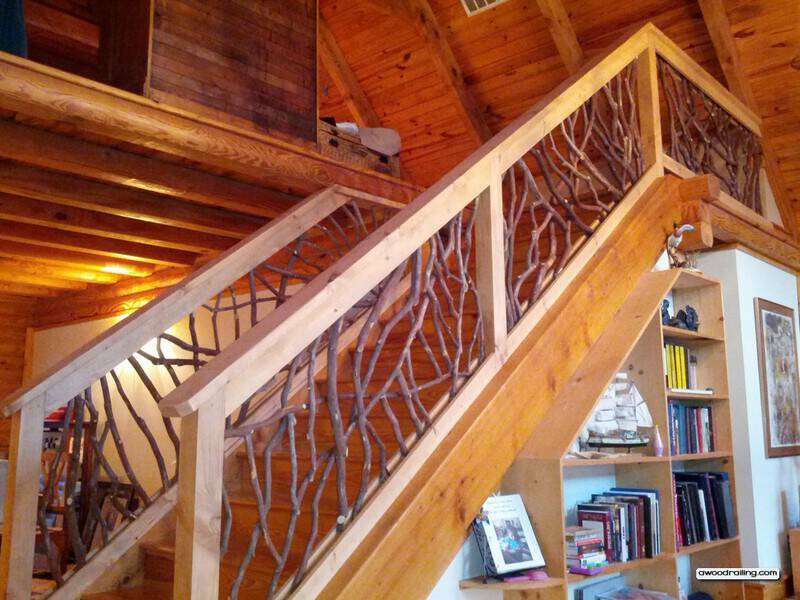 When it comes to installing rustic staircase railing, from design to installation, it takes the right combination of technical expertise and a creative eye to install something that looks and feels like home. Without taking that time, the piece may look out of place or it may drown out the rest of the home’s beauty, which is certainly not its purpose. It takes an experienced eye, and a committed designer to develop a rustic staircase railing design that fits the textures, layout and size of the home—this is never a one-size-fits-all kind of project. We knew at first glance what kind of shapes would fit in this home. 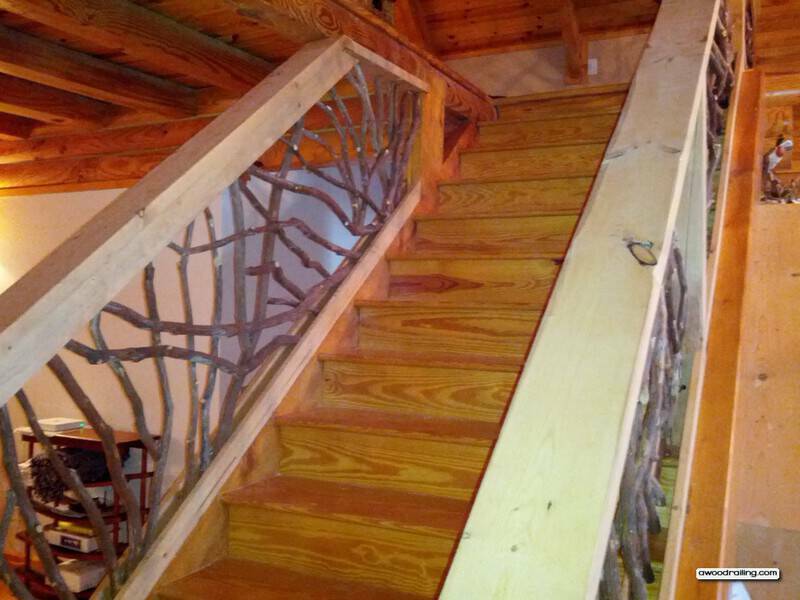 A rustic wood stair railing, with a more natural finish and natural curves would be a far better fit than a more modern design. We knew that a metal railing would look out of place. We were also inspired by the homeowner’s existing style, and made use of the shapes and textures already found in the home. The vaulted ceiling, tongue and groove wood paneling, big timber rafters and antler chandelier hanging from the collar tie were perfectly paired with this particular decorative handrail. Since there are already plenty of strong straight lines, the sinuous shapes of woven branches tie all the different wood elements together. The result is balance and beauty, without being overwhelming. The elegance of the curved branches in the handrail pair almost exactly with the antler chandeliers. The crew has developed a keen eye for detail. Working with a material palette that is mostly wood, it is a challenge to pick suitable colors and lumber. Since there is so much wood already, it made more sense to strike a bit of a contrast, as opposed to trying to find an exact color match. Color can really change the dynamic and feel of a room, and many people may not realize the role a big, powerful rustic stair railing like this can play in creating an atmosphere. So striking a contrast is what was done here. You will notice a lighter color stain on the same pine lumber, which lightens up the room. The mountain laurel branches are a deeper, reddish brown color, and work their magic in adding depth. The result is a room that is cozy, comfortable, and easy on the eye, while still boasting a stunning, rustic design. Every home is unique. Even two homes built with the same exact layout can have completely different elements in them that would warrant a different design. The walls, furniture, decor, stains all tell their own story in each home. We always look for a particular center of gravity in the layout of the home, and create designs to align with that, and flow with the lines, shapes and patterns of the home. We also gain inspiration from our clients’ own style, working with them instead of stubbornly imposing our own vision on their home. Another recent project features a unique rustic stair railing. In all homes, stairs are more than just a solely component connect two floors together. Many people underestimate how much impact a staircase can have on the atmosphere of a home. Strong design skills also make stairs an element of design to tie into the homes structure and decor and create a room that feels comfortable and well-designed. In this particular home, the stairs ascend from the living room to the second floor and are an important visual element of the rustic home decor. The wall against which the stairs rest are made with a stone pattern with alternating shades of grey. 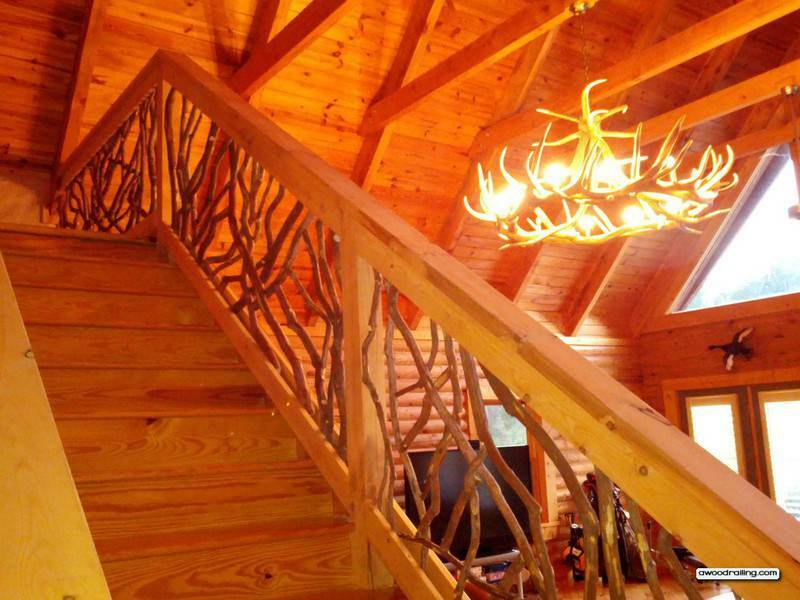 The railing design must appropriately compliment the rest of the home, and its unique, nature inspired features. This is the kind of layout that needs a truly customized approach. With this installation, the staircase is supported by an 8-inch to 10-inch diameter hickory log and finished at the bottom with a hickory newel post, both of which are in their natural state with the bark on. This is the kind of center of gravity that we tend to build around. The natural, unfinished bark gave us some ideas to work with when it came to designing the staircase. This room was smaller than the one we worked with above, so that played a role in the size of the staircase railing we ultimately designed. We absolutely love homes with features like these—natural fixtures make homes unique, and add something that breaks up the room creatively and comfortably. Because we are experienced in designing rustic staircase railings, we always welcome the challenge of designing with and alongside features like these. A big part of home design is texture, and this is a great example case. Texture is found on the walls, the floor, the ceilings, and of course, the stairs. When we are developing a rustic staircase railing design, we are taking into consideration what kind of textures are in the home, and what we are going to be adding. The important thing is to compliment, instead of compete. Since this house is nature inspired, with a beautiful newel post in the center of the room, we definitely wanted to keep the nature-inspired theme going on. 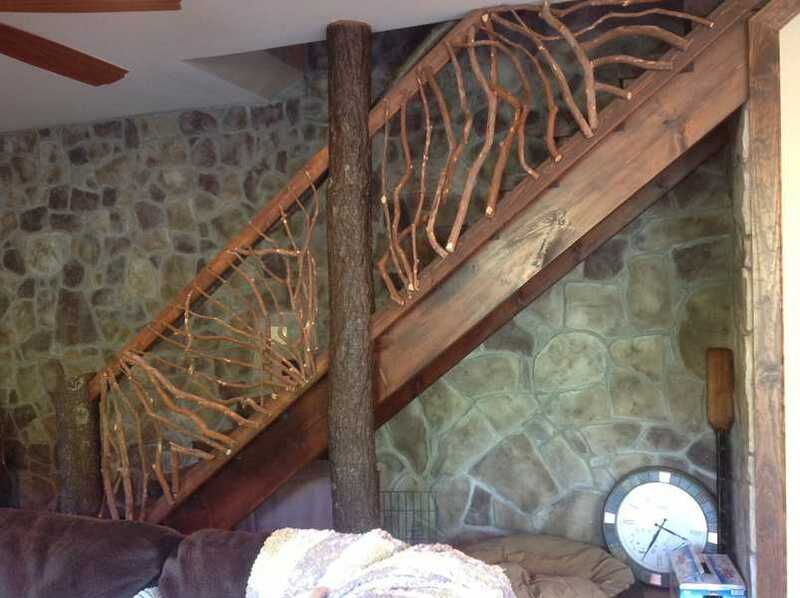 The tree branch stair railing that we installed is built with Mountain Laurel Handrails. With the stone wall in the background, this rustic stair and handrail give the feeling of being in the woods near a rock face. While the first home boasted a more finished, carved and designed look, this one feels more raw and natural. The stains we picked to color our project took into account the dark stone walls and the amount of light found in this room. The shade of brown in the railing closely matches the staircase itself. Because there is less wood in this particular room, we could get away with more color matching and did not have to worry as much about striking the right contrast. This is the finished product at the Gibson residence in West Virginia. The owners were very happy with the end result and it was a pleasure working with you on the project. As always, we love hearing firsthand what our clients reactions are when they first take a look at our work, but we also love to hear what our partners in construction have to say. We do not just work with homeowners, but with fellow construction and home improvement professionals as well. We depend on their construction expertise to help us create, and as a team, we are all working toward the same goal: a very happy client.